Are Neonics in Your House Plants? Who would think that our houseplants could be treated with toxic neonicotinoid insecticides that have been banned in Europe and implicated in mass bee die-offs? Home Depot should remove these plants. The EPA is not protecting us. Not good for the bees and not good for us. If you see this label on houseplants or garden plants, DO NOT BUY. 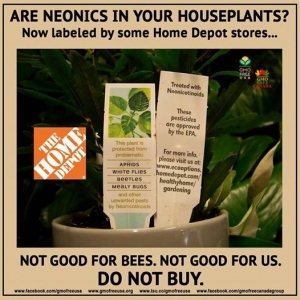 And tell Home Depot to ban neonic-treated plants, flowers and sprays from their nurseries.